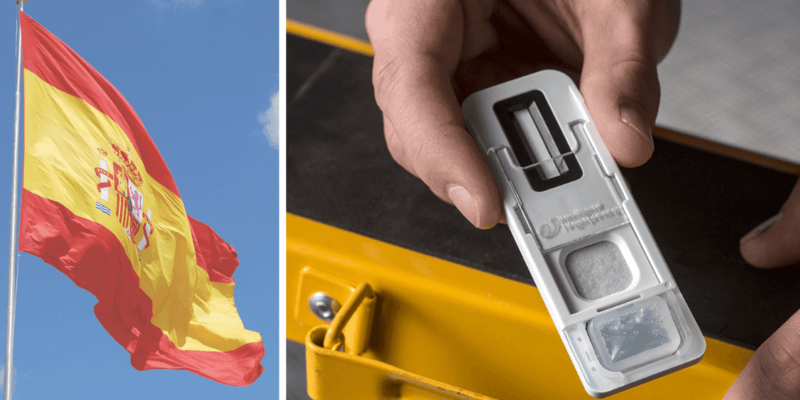 UK-based Intelligent Fingerprinting has announced the availability of its new fingertip-based drug screening system to support Coroner services. 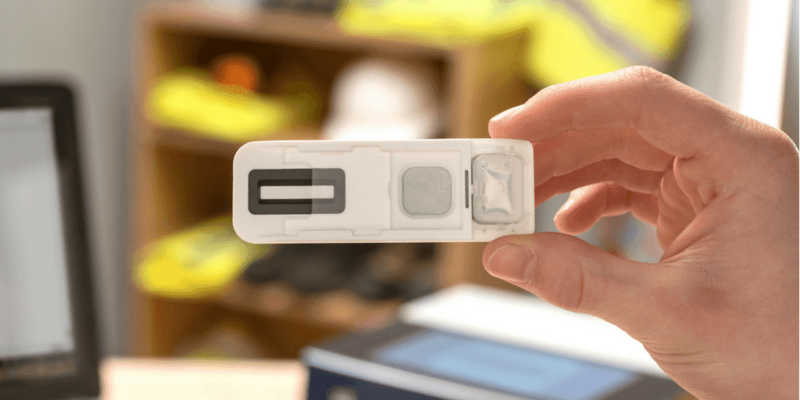 The company’s revolutionary technology detects drug use by analysing the sweat on the tip of a finger that forms a fingerprint, and its non-invasive approach provides a rapid and convenient way for coroners to screen the deceased for recent drug use. Toxicology tests are an important tool within post mortem examinations and are often used by the Coroner to investigate drug use that might have contributed to the cause of death. Conventional toxicology tests require the collection of invasive body fluid samples, usually taken as part of the post mortem examination. These are then typically sent away for analysis by external testing laboratories. With Intelligent Fingerprinting’s new Drug Screening System, however, tests can be carried out within the mortuary from non-invasive fingertip sweat samples that are collected immediately as required outside a full post mortem examination. Sample collection takes just seconds and the system screens for multiple drugs of abuse in under 10 minutes. This provides very early intelligence on drug use that can be used by the Coroner to help prioritise when a full post mortem is needed, and – potentially – enables earlier release of the deceased back to their families. Based on work initially funded by a Biomedical Catalyst grant from Innovate UK, the two-part Drug Screening System consists of single-use, tamper-evident Intelligent Fingerprinting Cartridges (for sample collection) and the portable Intelligent Fingerprinting Reader 1000 analysis unit. The Cartridge uses lateral flow assay technology and fluorescence-labelled antibodies to selectively detect specific drugs or their metabolites in eccrine sweat collected from a fingerprint. The portable Reader 1000 is a highly sensitive, robust and effective fluorescence measurement instrument which is used to read the Cartridge, providing a positive or negative result for four groups of drugs – amphetamines, cocaine, opiates and cannabis. Trials have been conducted in three areas – Plymouth, Torbay and South Devon; South Yorkshire (West) and Staffordshire (South) – to evaluate how the system could provide early intelligence on cause of death. Over two hundred fingertip sweat samples were tested for the presence of four drug groups, with the results being compared for accuracy to samples taken with traditional methods and sent for laboratory analysis. “Our trial results showed that the Intelligent Fingerprinting Drug Screening System can detect the use of drugs prior to death, and revealed a 94% to 99% correlation to laboratory results. 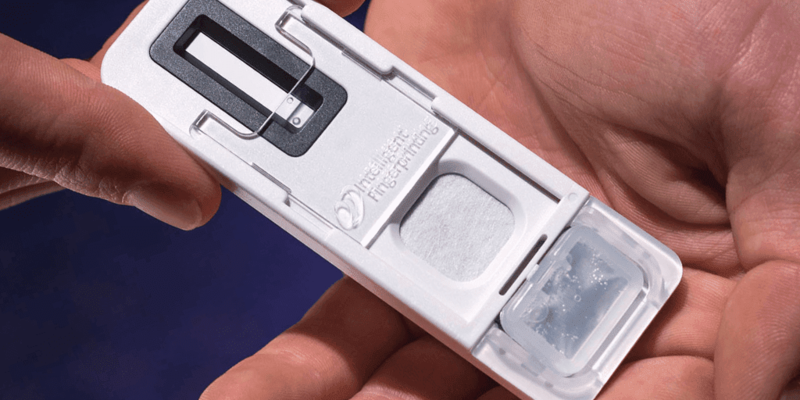 This demonstrates the effectiveness of fingertip-based testing in providing Coroners and their staff with valuable drug use intelligence as to the possible cause of death,” said Dr Jerry Walker, Chief Executive Officer, Intelligent Fingerprinting. “In comparison to traditional blood, urine or saliva body fluid tests, our non-invasive fingertip sweat samples can be collected and analysed immediately on arrival at the mortuary. This contrasts with body fluid sample tests that require specialist and hygienic collection and disposal, and are typically only collected and analysed if a full post mortem examination is carried out. “This ability to gain very early drug use intelligence outside the post mortem examination provides a new opportunity for Coroners and their staff to expedite and direct further investigations and toxicology analysis,” he added. “This early information can be used to inform any further post mortem examinations and toxicology tests, helping the Coroner to prioritise valuable resources where they are most needed”. To learn more about how non-invasive drug screening works, and how it can become a valuable drug screening technology for Coroner services and other applications, view the Intelligent Fingerprinting introductory video. Intelligent Fingerprinting’s unique fingertip drug test is set to revolutionise the way drug screening is carried out across a range of sectors. The distinctive Intelligent Fingerprinting technology, which works by analysing the sweat from a fingerprint sample, enables non-invasive, cost-effective screening for multiple drug groups in less than 10 minutes (currently amphetamines, cannabis, cocaine and opiates).